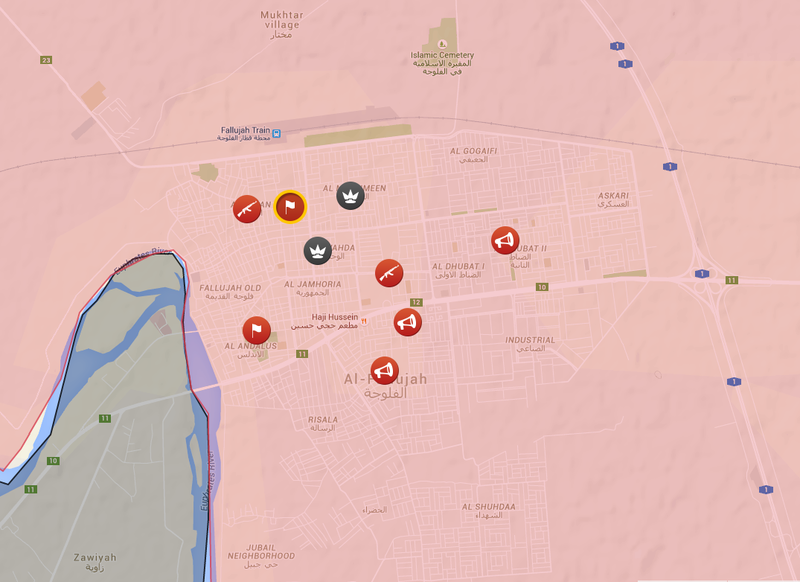 ISIS has been driven completely out of Fallujah, and mop-up operations have begun to clear the highways between Fallujah and Ramadi. But ISIS troops there have nowhere to hide, and the Iraqi Army has the numerical and mechanical advantage. It should take a few weeks. What's quite amazing is that Fallujah actually had 4,000 ISIS troops, and the Iraqi Army dealt with them pretty quickly once they punched in. It's an amazing victory and shows that the spear tip of the Iraqi Army is quite sharp. Well-done. After that mop-up, the road to Mosul is clear. Manbij is taking much longer than I thought, in part because my troop counts weren't up to snuff. 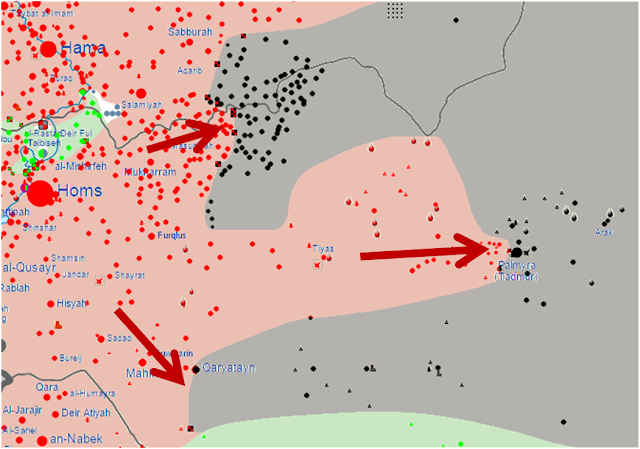 The Kurds are slowly working their way to the edge of the city, and keep repelling ISIS counter-attacks. 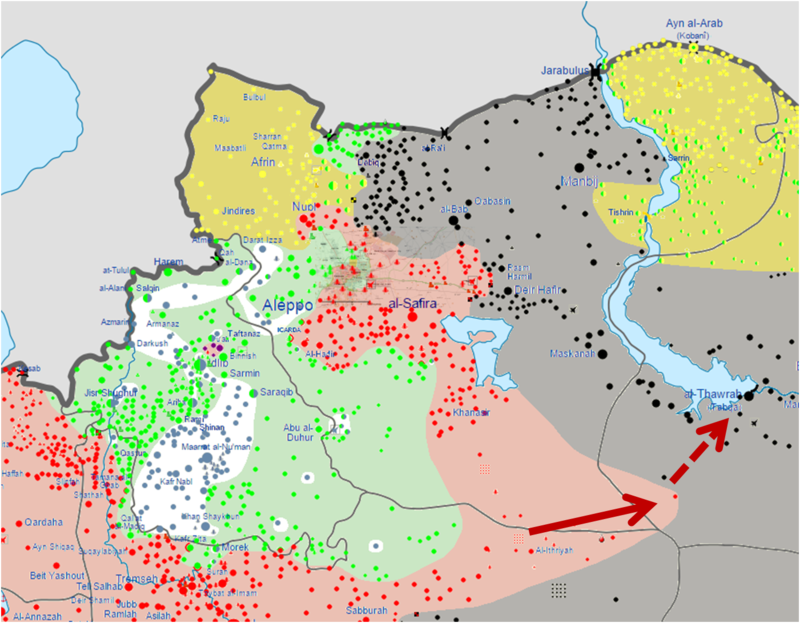 In a way, this is good: the Kurds are quite stiff of spine, and have so much territory around Manbij surrounded that, if they are successful, they will likely destroy the 2,000+ unit in the city. So it will take some time, but momentum is definitely in the hands of the Kurds and SDF (Syrian Democratic Forces). One of the tricky things about hitting ISIS is that they can hit back pretty well while you're mired down in IEDs and sniper fire. ISIS can go on the offensive somewhere if you've concentrated all your troops for a single offensive. Frequently ISIS responds to offensives with suicide attacks in civilian centers in the hopes of distracting the military forces against them. So lone offensives are incredibly risky. And, as we know, the Iraqi army doesn't always do well when on defense. The Syrian Army is exhausted and depleted from 5 years of war. For short-term better, and long term... probably worse, each of these armies is deeply reinforced by fresher, more elite troops, and short-term allied with the ever-vigilant Kurdish Peshmerga. Iranian troops are in both Syria and Iraq. Syria's spear-tip is sharpened by Hezbollah, and they're supported by primarily Russian airstrikes. In Iraq, Sunni and Shiite tribal militias provide a lot of the hammer that the army needs, and US elite troops are on the ground to provide intelligence and backbone to offensive operations. And as much as the Iraqi army is a mess, there are pockets of excellence in the elite counter-terrorism units, which are the first charging into Fallujah. This hodgepodge seems to be a combination that has a shot at winning. After a few months of stagnation, the Kurds, Iraqis, and Syrians have all kicked into high gear... almost as if they're coordinating. And they might well be. 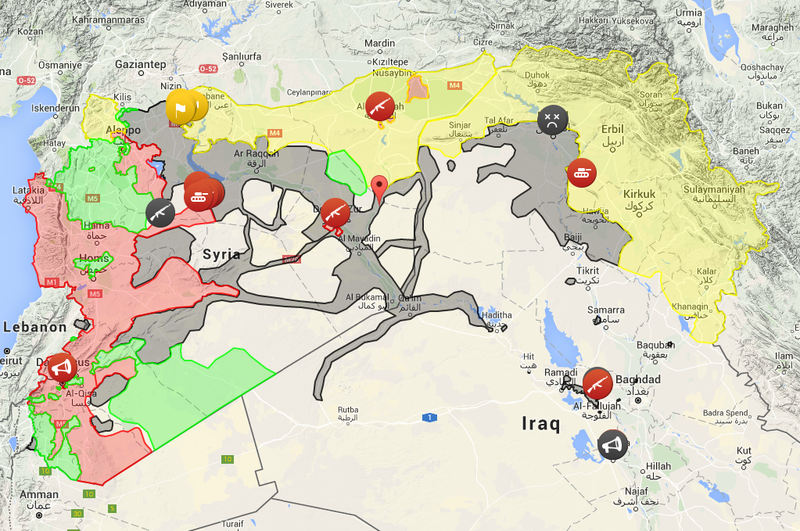 They're pushing hard on three fronts (while the Syrian Rebels seem to be mostly licking their wounds and holding fast around Aleppo right now), which might just keep ISIS off-balance. 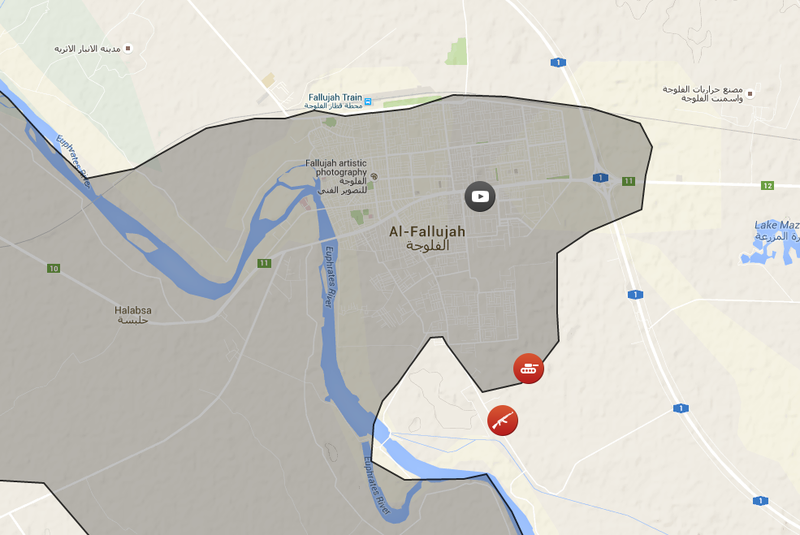 Let's take a look at what's going on in Fallujah, Raqqah, and Manbij. I'm currently using LiveUAMap, which updates daily, and the last few days have seen a lot of movement. We all know this one's been long in coming, and that Fallujah's been under siege by the Iraqis for months. They move excruciatingly slowly (possibly to mitigate the risk of a disorganized force panicking and fleeing), and people in Fallujah are starving for it. But they've finally gotten their claws into the city and are crawling their way through. 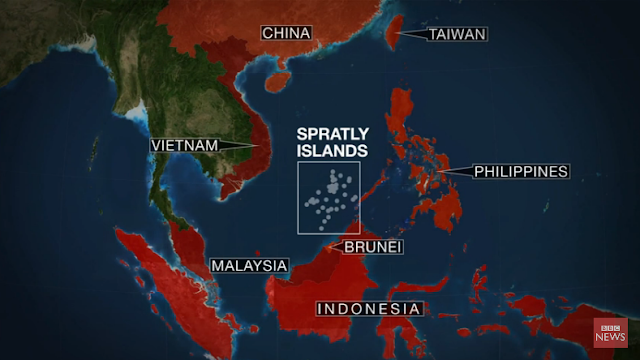 Counter-terror units are grinding their way in from the south. As you can see, they haven't quite penetrated the tight-knit city blocks yet, and once they get in, it's going to be a bloody, messy affair. They're supported by a lot of US airstrikes and US "advisors" on the front lines. The really good news is that the Iraqis have repelled a pair of counter-attacks by ISIS troops. Clearly, ISIS (which is of course greatly outnumbered in Fallujah right now) was testing to see if Iraqi organization or will would break under direct assault, but it held firm. It's a huge step forward from 2014's humiliating retreats, and I'm predicting that Fallujah is about a month away from falling. Iranian-backed Shiite militias are on hand to deal with counter-attacks or ISIS retreats from the city, but aren't pushing in: the Iraqis wisely made sure the only militias going into the city at first are Sunni, as there's still a lot of distrust among Sunnis for the post-2003 invasion reprisals by Shiites. 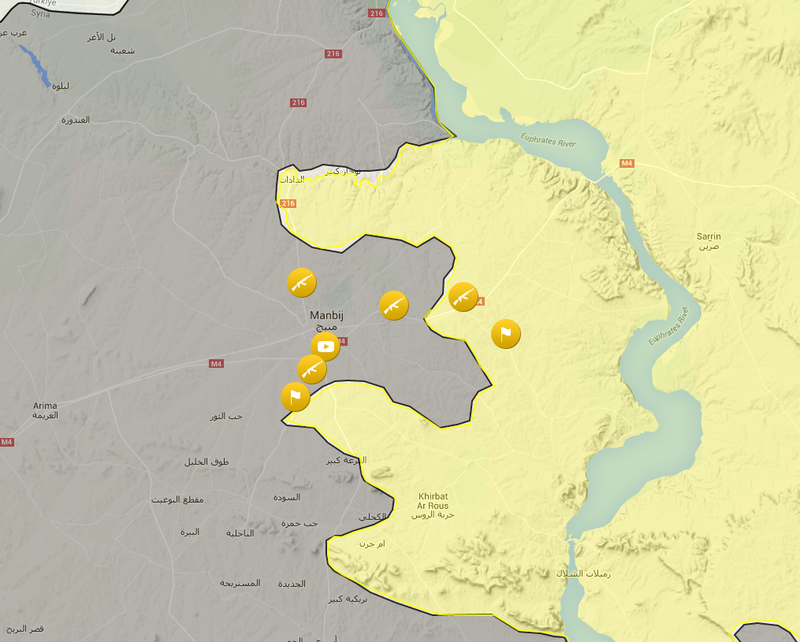 Manbij is a town that sits on the crossroads of 2016 and M4, which are both supply routes from Turkey that ISIS has been using to resupply Raqqah and its Aleppo province operations. 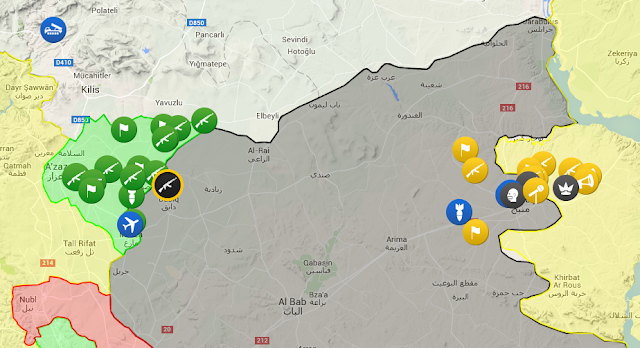 A few months ago, Kurdish troops advanced modestly towards Manbij from the south via a bridge across the Euphrates, but were held fast by ISIS resistance. Things cooled down for a bit. 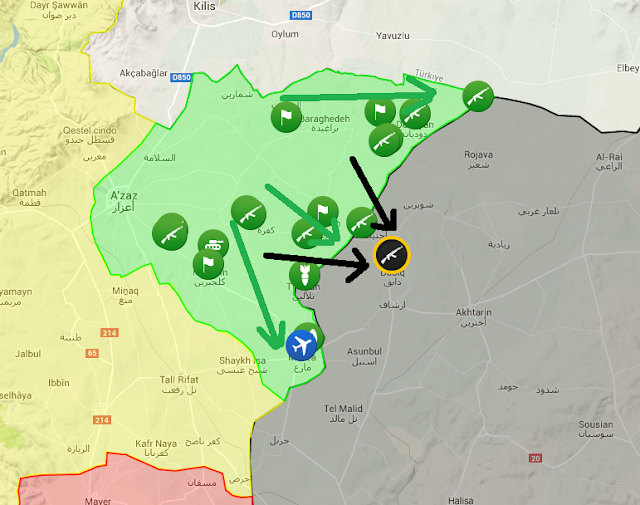 After that, ISIS turned its guns west to try to take A'zaz and Marea (north-northwest of Aleppo) from rebel troops and to hold off a counter-attack by Syrian troops from the airbase east of Aleppo (where troops had held out for over a year before finally being reinforced). 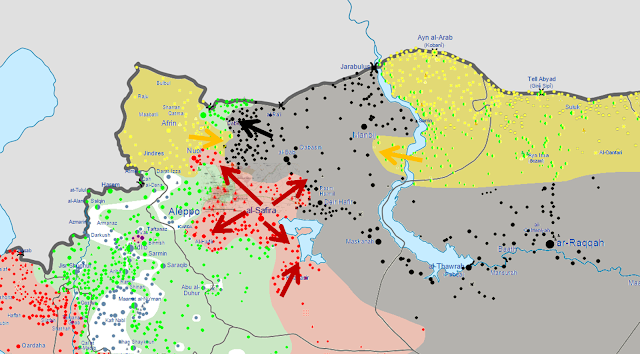 That shift in force gave the Kurds an opening, and they took it. 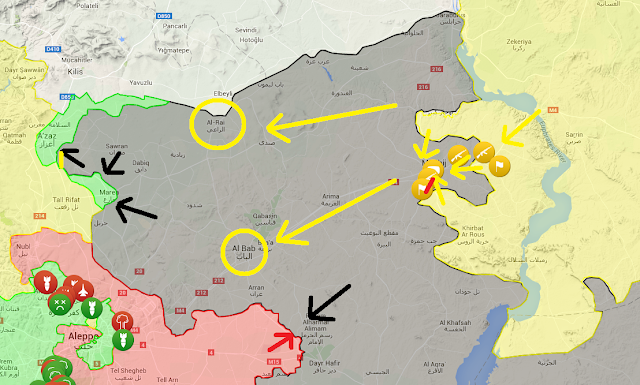 The Kurds are storming Manbij from three directions at once, and the map above keeps changing by the day in the Kurds' favor. I anticipate it'll fall within the week. After Manbij, the Kurds will still have a huge advantage while ISIS remains bogged down to the west, and I suspect they'll try to push that advantage. That said, ISIS could counter-attack, and they'd be in a frustratingly good position to disengage from the west, because (as you can see below) the Syrian rebels and government troops are back to fighting for Aleppo. But if the Kurds can move quickly, they'll be on a race to try to take the other border crossing with Turkey. If they can pull it off, they'll have isolated Raqqah completely. Raqqah seemed like it was going to be the last nut to crack in the ISIS war, but the Kurds and Syrian troops seem to have different plans. Pressure on Raqqah would of course make life much harder for ISIS troops elsewhere, and coalition troops would be able to focus on eliminating pockets one at a time. The Syrian army has mustered a whole bunch of tanks to race towards Al Tabqah. 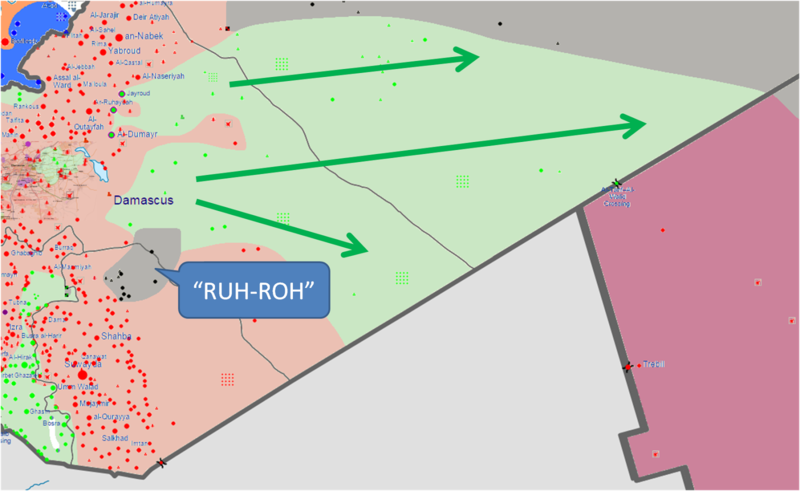 It's open desert along the highway, where the more mechanized Syrian army--with Russian air support--has a huge advantage. They're picking up a few kilometers per day and should be able to close the distance to Lake Assad and the Euphrates river. 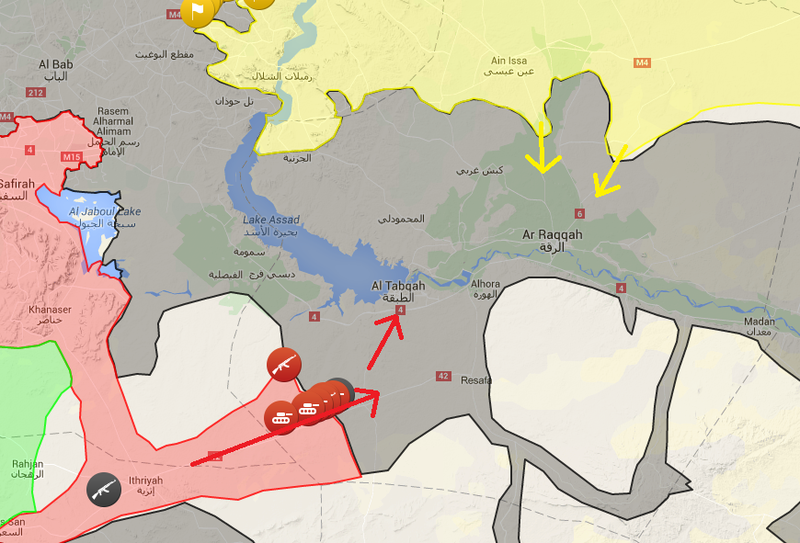 If they pulled that off, Raqqah would become totally cut off from ISIS troops in Aleppo province. 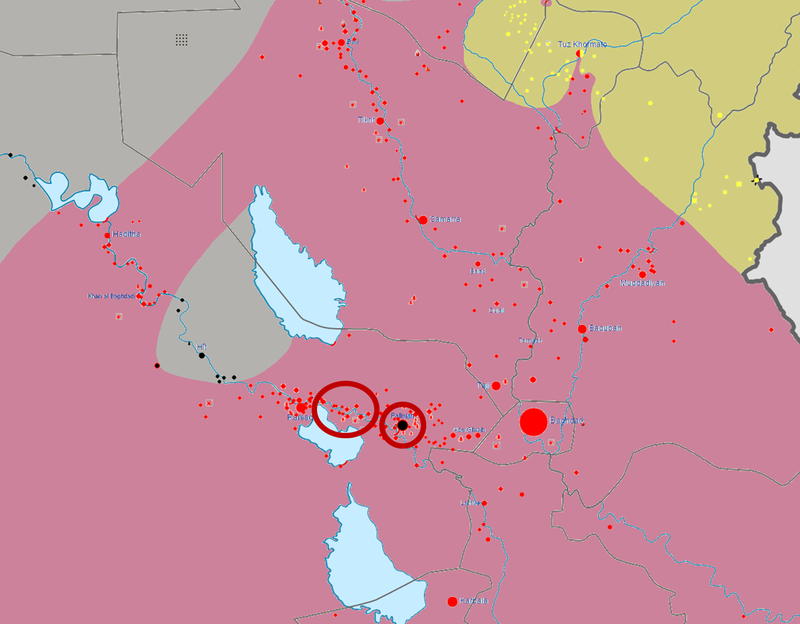 Kurdish troops are also more quietly wiggling their way from the north. I'm a bit surprised at this for two reasons: first, Raqqah doesn't have many Kurds, so the Kurds have less of a dog in this fight. Second, it's a displacement of troops that could be used in Aleppo. Given that, here's my thought: I suspect the Kurds are absolutely not going to storm Raqqah, but they want to move the front line further away from Kurdish territory, and be on-hand to cut down ISIS troops trying to flee north and west if the Syrians move into the city. 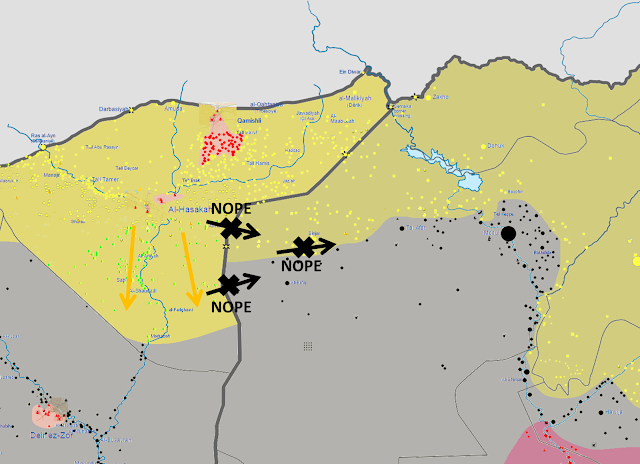 The Kurds will keep the highways going in and prevent ISIS from moving freely. 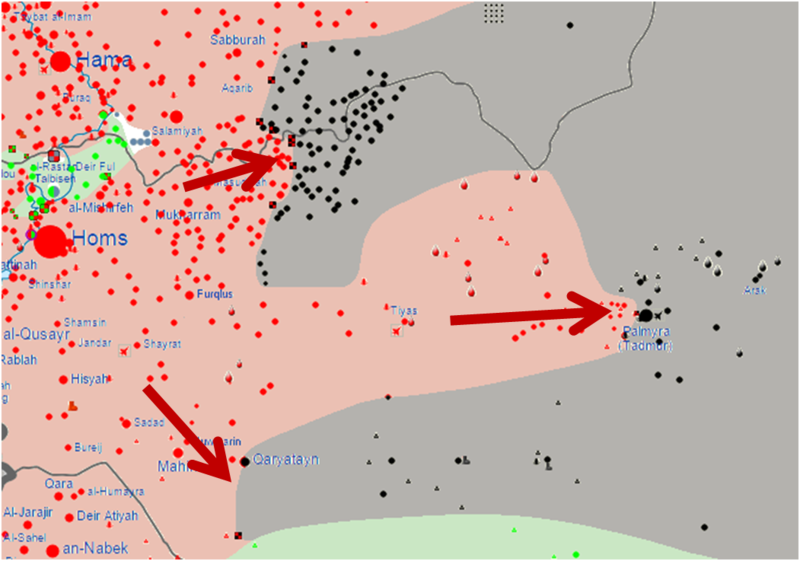 The real fight will happen between Syrian Army and ISIS troops. I'm not sure if the Syrian Army intends to take the fight into the city now, but if they did, it would be a huge momentum swing. Assad and Putin may have decided going for the heart of the operation, a la Enders Game, is the fastest way to end the fight--much faster than slowly clawing back territory and saving Raqqah for last. So ISIS is under pressure on three fronts. They probably have 100,000 men deployed in Syria and Iraq: if we compare this to the Peshmerga's 300,000, the Syrian Army's 150,000, and the Iraqi Army's about 200,000 fit-for-service troops, there's a more than 5:1 advantage. The trick of being able to use this advantage--against a dug-in and mindbogglingly fanatical force--is to be able to pick battles where the numbers are overwhelming and the enemy is off-balance. 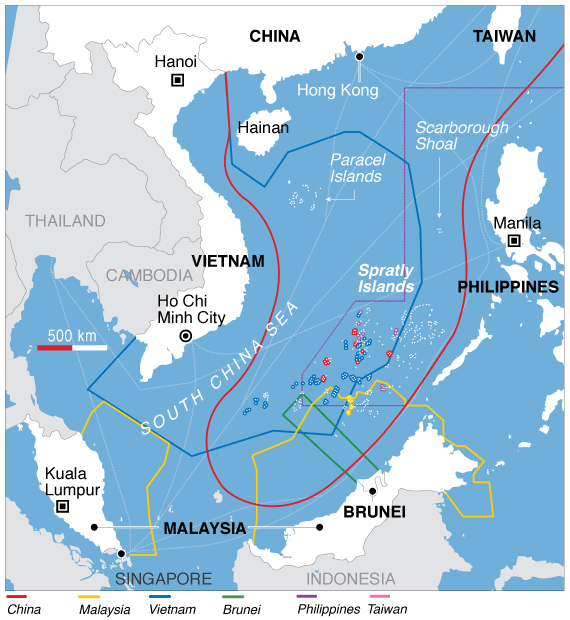 If these forces can bring guns to bear in a really coordinated way, they'll be able to make sure of just that advantage.